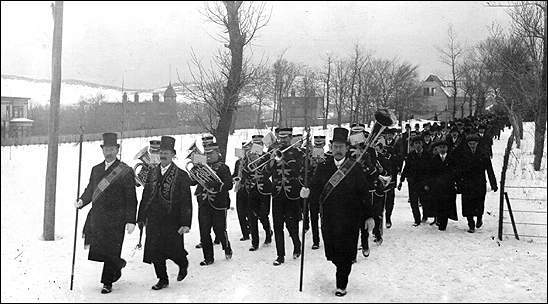 At the start of the First World War, Newfoundland was home to several fraternal organizations - societies of men, who came together under a shared interest, cause, or background, and often engaged in some form of community service. Many of the groups also served as mutual benefit societies. Members paid a monthly or annual fee, and in return had access to insurance, pension, or savings plans. Fraternal organizations played an important role at a time when the government provided few social services. Courtesy of the Provincial Archives of Newfoundland and Labrador (A 36-152), St. John's, NL. 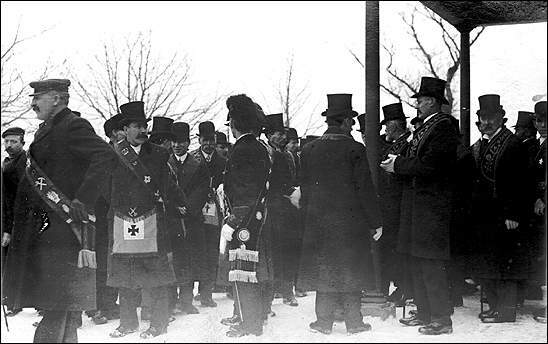 Some societies were branches of larger organizations, such as the Knights of Columbus, which formed in the United States in 1882. Others were unique to the dominion, such as the Society of United Fishermen, which formed at Heart's Content in 1862. Most were affiliated with a religious denomination. The Knights of Columbus and the Newfoundland Fishermen's Star of the Sea Association both had ties to the Roman Catholic Church, while the Loyal Orange Association, the Society of United Fishermen, and the Sons of England all had Protestant connections. Some groups, like the Freemasons, were not affiliated with any church. 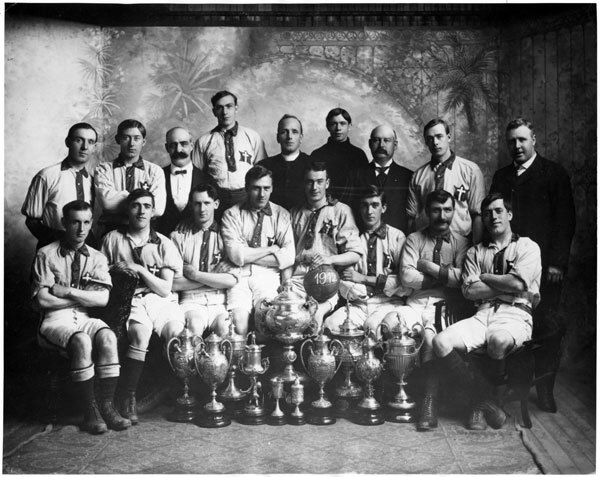 Courtesy of the Rooms Provincial Archives Division (Sports Archive Division: 1.41.01.103), St. John's, NL. Fraternal organizations and their women's auxiliaries actively participated in Newfoundland's war effort. They supplemented the recruiting and fundraising activities of the Newfoundland Patriotic Association (NPA) and the Women's Patriotic Association (WPA), and they contributed resources to both groups. For example, the Star of the Sea Association announced on August 31, 1914 that it would give the NPA free use of one floor of its building in downtown St. John's. It also donated $100 to the NPA and promised that other instalments would follow. Other fraternal groups were similarly supportive. The organizations also helped their own members in the Armed Forces. They paid the membership and insurance fees for their enlisted men, and kept in contact with troops serving overseas and their dependents at home. Courtesy of the Provincial Archives of Newfoundland and Labrador (A 36-155), St. John's, NL. 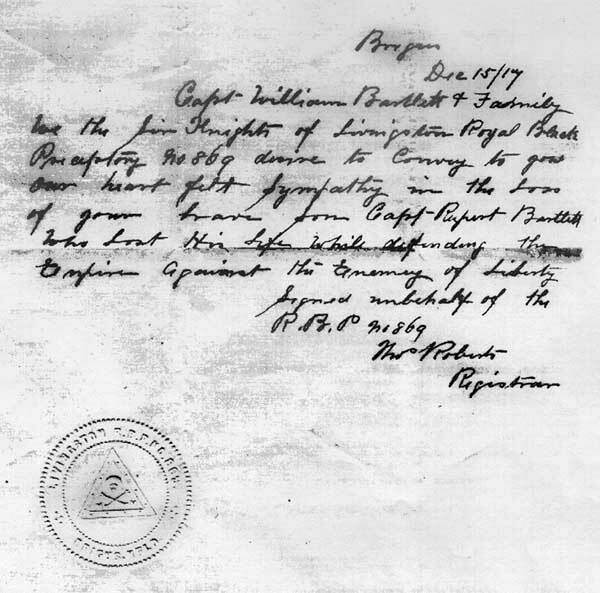 The following letter, written by the Society of United Fishermen to Naval Reservist Ruben Laite, was a typical example of the letters sent to members overseas. The Lodge requested me for to write you and let you know how things are progressing here. We have our new hall pretty near finished, have lumber enough on hand to finish up. Had ten initiations last fall and Thomas Laite is back again with us. Three deaths last 12 months: William Watts, Mark A. Hart, and Billy Jones, who was drowned in the North Sea. No colds. Not much strange news here, only the old thing over again. Your Father, Mother, and Blanche is just about the same. You know that they are staying in with Hubert this winter, Father says he is coming out again the first of April. The Lodge is keeping all the members that's away to the war fully paid up until their return home again. All the Brethren joins with me in sending their best wishes to you and for a safe return home if it's God's will. The associations also played an active role in consoling bereaved families. 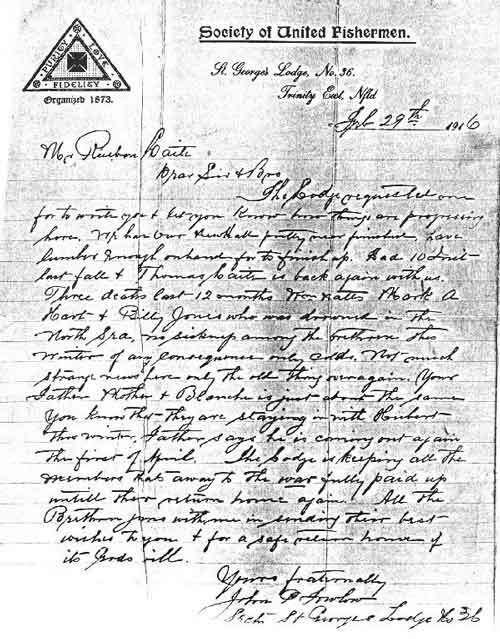 In 1917, the Loyal Orange Association sent sympathy letters (shown below) to the family of Captain Rupert Bartlett of the Newfoundland Regiment. He died in action at France on November 30, 1917 at the age of 26. 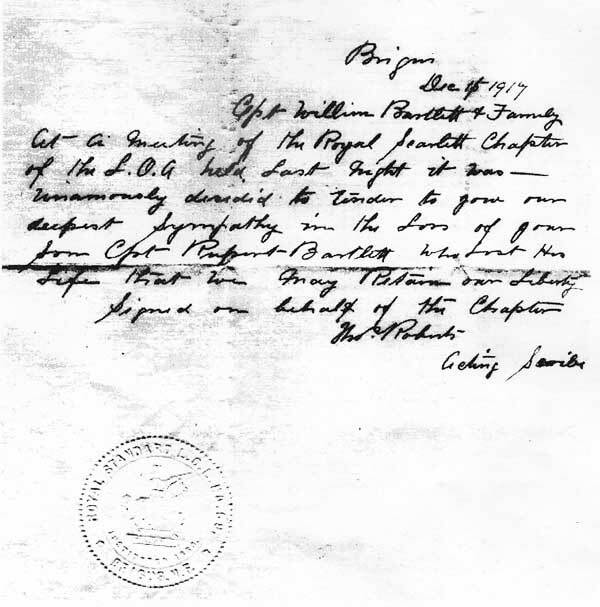 Other groups wrote similar letters in the case of a member's death. At a meeting of the Royal Scarlett Chapter of the L.O.A. held last night it was unanimously decided to tender to you our deepest sympathy on the loss of your son Capt. Rupert Bartlett who lost his life that we may retain our liberty. We the Sir Knights of Livingston Royal Black Prefactory 910809 desire to convey to you our heart felt sympathy in the loss of your brave son Capt Rupert Bartlett who lost his life while defending the empire against the enemy of liberty. 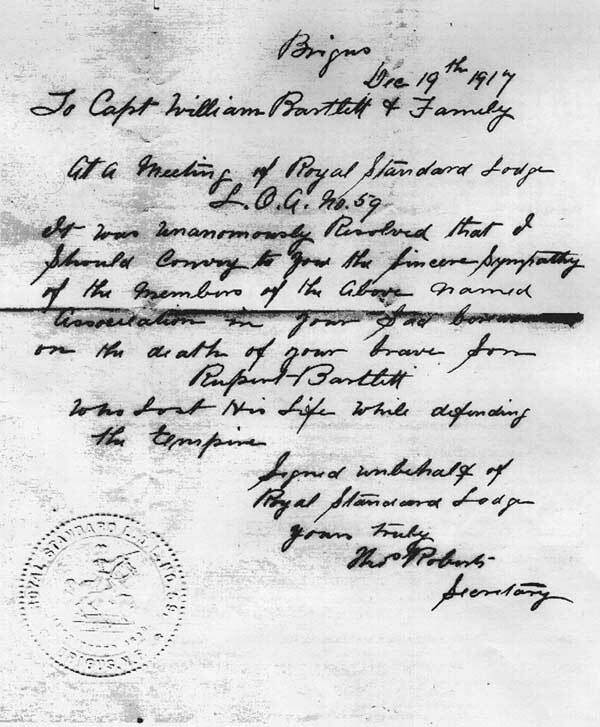 It was unanimously resolved that I should convey to you the sincerest sympathy of the members of the above named association in your sad bereavement on the death of your brave son Rupert Bartlett who lost his life while defending the empire. Finally, fraternal organizations were active in raising memorials to preserve the memory of their fallen members. 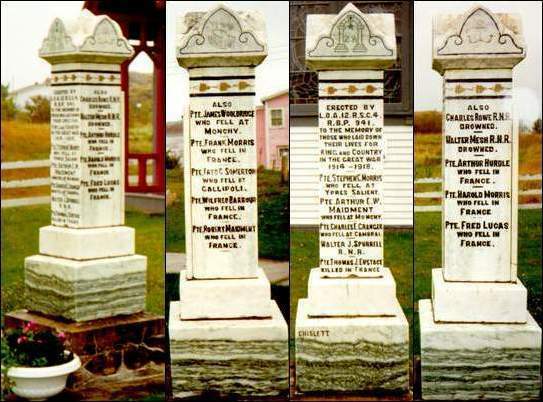 The following images of the memorials erected by the Knights of Columbus in St. John's and the Orangemen in Trinity are examples of fraternal commitment to remembrance.